I put off writing about this match until I had calmed down. It hasn't helped. Saints managed to comprehensively shoot themselves in the foot for not only this match, but also Saturday's Premier League game against Everton, by having Gardoş sent off with a straight red (misses three games, but we won't miss him), plus Schneiderlin and Wanyama each getting yellow cards and reaching the magic 5 bookings, which means they now both miss the next match. That wasn't the end of it by a long chalk, as the whole side looked utterly inept and I really can't remember a Saints side look so completely bereft of ideas since the long, dark days of the Championship, before Marcus Liebherr rescued us. Ronald Koeman now has a team that have been completely drained of confidence and some of the better players look exhausted and in need of a rest. He tried to rotate what players he had, bringing in Gardoş for Toby Alderweireld (who was on the bench) and Targett at left back with Bernard moving forward to left midfield. Mané was moved across to the right and Long up front. Ward-Prowse was in Davis usual slot in the midfield. The team selection problems became obvious, as soon as you noticed that there were only six reserves and wondered why one of the youngsters had not been called up. I don't intend to cover the first half in much detail. 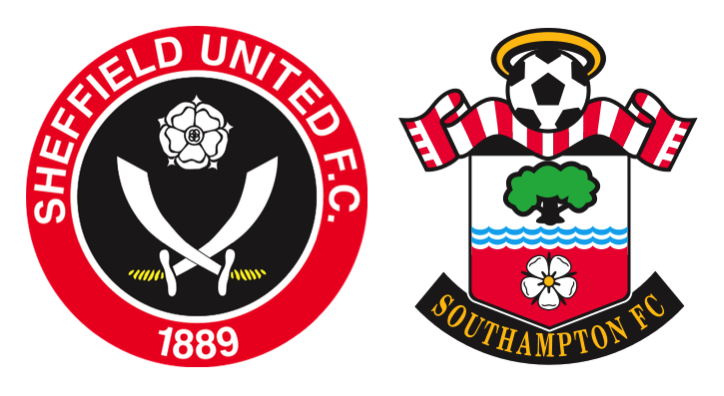 Suffice to say that Saints looked laboured while Sheffield United looked up for the contest. Even so, neither goalkeeper was troubled much in the first half. The only person that looked troubled was the referee, kept busy by Saints players constant late tackles. Mané in particular was very lucky indeed not to have been sent off. He was booked and then continued to look as thought he were trying to get Mr Foy to book him again. To be honest, there were at least four occasions when he could have been booked and there would have been no cause to complain. During the interval Radio Solent commented on the fact that Isgrove was warming up. You can guess who I thought was not going to re-appear for the second half, but I was wrong. Instead Isgrove came on for Targett, with Bertrand dropping back to left back and the young winger taking up the position that Bertrand had occupied, without much success in the first half. The changes made no difference, the Blades continued to look far more threatening and Forster made several good saves, but the goal, when it came in the 63rd minute was almost comical. Once again Mané was doing his headless chicken impression (anyone remember 'Chicken George'?) and brought a Sheffield Utd player down right on the edge of the penalty area and slap bang in the middle. Forster managed to see the ball coming and could only palm it along the edge of the goal line, but at least three United players were bearing down on him and it was McNulty that got there first. 1-0. All game I had the feeling that even if the it had gone on until Christmas Day, there would have been not the slightest chance of Saints scoring. A feeling somewhat borne out by the statistics, which show just a solitary shot on target during the whole game. In spite of this, I was hoping that the Sheffield team would tire towards the end and this would offer us a chance to save the game. Sure enough, the third tier team started to slow down, but Gardoş then managed to get himself sent off with a straight red for a very rash tackle. Saints never looked like doing anything after that and the only thing that happened was a war of words between the two benches, which led to one of the Sheffield United coaches being sent to the stands by the Referee. Following on from this, after the final whistle Ronald Koeman declined to shake hands with Nigel Clough, the Sheffield United manager. From a Saints perspective, a sad end to a very poor match, made worse by Saints fans abusing the few players who took the trouble to come over to their away end. There were also reports of trouble between different groups of Saints fans. So, that was the limp end to the Capitol One Cup campaign for this year. Something that we were told was one of the clubs main priorities. That was also the fifth loss in a row and the heady days of second in the Premier League, with win after win, seem a long time ago now.